John Francis "Jack" Buck (August 21, 1924 – June 18, 2002) was an American sportscaster, best known for his work announcing Major League Baseball games of the St. Louis Cardinals. Buck's play-by-play work earned him recognition from numerous Halls of Fame, such as the National Baseball Hall of Fame, Pro Football Hall of Fame, and National Radio Hall of Fame. He has also been inducted as a member of the St. Louis Cardinals Hall of Fame Museum. Buck was born in Holyoke, Massachusetts, but moved to the Cleveland, Ohio area with his family in 1939. After graduating high school, Buck worked on large shipping boats that traveled the Great Lakes. Buck was drafted into the United States Army in June 1943, and later was awarded a Purple Heart as part of his service. After completion of his military service in 1946, Buck enrolled at, and graduated from, Ohio State University. Buck's early sportscasting career included work for the minor league affiliates of the St. Louis Cardinals. In 1954, Buck was promoted to radio play-by-play of Cardinal games on KMOX, a position he maintained for nearly all of the next 47 years. He was known in St. Louis for his trademark phrase, "That's a winner! ", said after Cardinals victories. In addition to his work with the Cardinals, Buck also earned assignments on many national sportscasts, including radio coverage of 18 Super Bowls and 11 World Series. Some of Buck's famous play-by-play calls include the dramatic walk-off home runs hit by Ozzie Smith in Game 5 of the 1985 National League Championship Series, by Kirk Gibson in Game 1 of the 1988 World Series, and by Kirby Puckett in Game 6 of the 1991 World Series. In the final years of his life Buck also became recognized for writing poetry, culminating in national attention for his poem "For America", written after the terrorist attacks of September 11, 2001. The latter part of Buck's career found him working side-by-side in the Cardinals booth with his son Joe Buck, who also rose to national sportscasting prominence. Buck was born in Holyoke, Massachusetts, the third of seven children by Kathleen and Earle Buck. His father was a railroad accountant who commuted weekly to New Jersey. From an early age Buck dreamed of becoming a sports announcer, with his early exposure to sports broadcasting coming from listening to Boston Red Sox baseball games announced by Fred Hoey. Part of Buck's childhood coincided with the Great Depression, and Buck remembers his family sometimes using a metal slug to keep a coin-operated gas meter going during the winter to provide heat for their home. In 1939 his family moved to Cleveland, Ohio to join their father, who had a job with the Erie Railroad. Soon after though, Buck's father died at the age of 49 due to uremic poisoning related to high blood pressure. Buck planned to quit high school in 1941 to take a full-time job in an effort to support his family. Dissuaded by one of his teachers, Buck decided to finish high school, graduating from Lakewood High School in the winter of 1942. After graduation, Buck followed one of his friends and began working on an iron ore freight boat operated on the Great Lakes by the Cleveland Cliffs Iron Co. Buck served on a 700-foot steamer named "The Sheadle", where he began as porter, and was later promoted to night cook and baker. After performing various other shipping related jobs, Buck attempted to become a "deck watch". A physical examination related to the deck watch application process revealed Buck was color blind, unable to differentiate between the colors green and brown. Ineligible for the promotion to deck watch, Buck subsequently became eligible for the military draft, and was drafted into the United States Army in June 1943. The physicality of Buck's work on the Great Lakes left in him good physical condition at the time he entered the Army. The 19 year old Buck stood five feet eleven inches tall, and weighed 165 pounds at the time. His first assignment was anti-aircraft training, and was sent to Fort Eustis, Virginia to undergo his 13 week basic training regimen. After completing his basic training in 1943, Buck was designated as an instructor, and assigned the rank of  Buck received further medical treatment at the 177th General Army Hospital in Le Mans, France where he was awarded the Purple Heart. Buck recovered, and rejoined his outfit sometime after German forces had surrendered. Declining to re-enlist, and turning down requests to enroll in the Officiers Training School, Buck joined his compatriots in guard duty of German prisoners of war. Buck received orders to ship home in April 1946, effectively ending his military service. After returning to the United States, Buck proceeded to work in various industrial-related jobs. When his friend Bill Theil told Buck he needed a roommate to attend Ohio State University with, Buck decided on the spot to join Theil and enroll at Ohio State. The suddenness of Buck's decision meant he had no corresponding paperwork that could be used to formally enroll at the University, so Buck attended classes of his own choosing until he was able to formally enroll. Buck majored in radio speech and minored in Spanish. He also worked several jobs while attending college, including one position at an all-night gas station. Buck crafted his play-by-play skills broadcasting Ohio State basketball games. After college, he called games for the Columbus Red Birds, a Triple-A (American Association) affiliate of the St. Louis Cardinals, in 1950–51. He spent the 1953 season as voice of another AAA Cardinals affiliate, the International League Rochester Red Wings on WHEC (AM). His work there earned him an invitation to join the big-league Cardinals' broadcast team in St. Louis the following season. Jack Buck was honored alongside the retired numbers of the St. Louis Cardinals in 2002. Buck started broadcasting Cardinals games for KMOX radio in 1954, teaming with Harry Caray, Milo Hamilton (1954), and Joe Garagiola (from 1955). Buck was dropped from the Cardinals booth in 1959 to make room for Buddy Blattner; the following year, he called Saturday Game of the Week telecasts for ABC. Buck was re-hired by the Cardinals in 1961 after Blattner departed; Garagiola left the following year, leaving Caray and Buck as the team's broadcast voices through 1969. After Caray was fired by the Cardinals following the 1969 season, Buck ascended to the team's lead play-by-play role. (1969 was also the year that Jack Buck divorced his first wife Alyce Larson – whom he had married in 1948 and had six children with - and married his second wife, Carole Lintzenich, who gave birth to their son Joe Buck in the same year). "Smith corks one into right, down the line! It may go!! ... Go crazy, folks! Go crazy! It's a home run, and the Cardinals have won the game, by the score of 3 to 2, on a home run by the Wizard! Go crazy!" Buck teamed with ex-Yankees and Pirates announcer Jim Woods in 1970–71. In 1972, retired Cardinals third baseman Mike Shannon joined Buck in the broadcast booth, beginning a 28-year partnership. On Cardinals broadcasts, Buck routinely punctuated St. Louis victories with the expression, "That's a winner!" In addition to Joe, Buck has three daughters who worked in broadcasting – Julie Buck on KYKY 98.1 in St. Louis (she now works at KLOU-FM 103.3, also in St. Louis), Bonnie Buck, who currently works in television in Los Angeles, and Christine Buck, who started her career at KPLR-TV in St. Louis. In addition, Buck's late younger brother, Bob Buck was a sportscaster and sports director at KMOX/KMOV-TV in St. Louis. Buck was well respected in the St. Louis community, where he lived and regularly volunteered time to host charity events. In addition to his sportscasting work, Buck served as the original host of the KMOX interview/call-in program At Your Service beginning in 1960. His guests on the program included Eleanor Roosevelt. Buck is featured in many of the stories in the book Carl Erskine's Tales from the Dodgers Dugout: Extra Innings (2004), a compendium of short stories by former Dodger pitcher Carl Erskine. Buck can be heard calling a (fictional) 1964 Cardinals broadcast in the 1988 film Mississippi Burning, and makes a cameo appearance in a 1998 episode of the television series Arliss. He also lent his voice to the 1995 edition of the RBI Baseball video game. 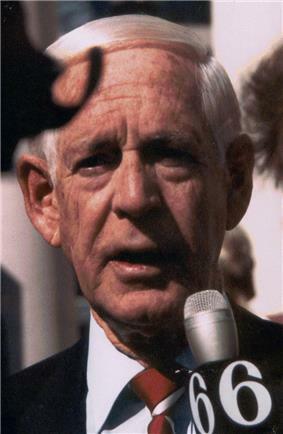 Jack Buck was also a renowned football broadcaster. In 1964 he began calling National Football League games for CBS television, following a four-year stint doing telecasts of the rival American Football League for ABC. Buck called Chicago Bears games in his first two CBS seasons, then switched to Dallas Cowboys games, including the famous "Ice Bowl" championship game in 1967. After the network moved away from dedicated team announcers, Buck continued to call regional NFL action through 1974, as well as several NFC Championship Games and Super Bowl IV. He also called the 1965 Cotton Bowl Classic for CBS. Buck served as the CBS Radio voice of Monday Night Football (teaming with Hank Stram) for nearly two decades (1978–1984 and again from 1987–1995). Ironically, in 1970 ABC's Roone Arledge had asked via telephone about Buck's interests in becoming the first television play-by-play announcer for Monday Night Football, but because of personal animosity surrounding his previous stint with the network, Buck would not return their phone call. (The television play-by-play role would go to Keith Jackson instead.) In addition to MNF, Buck called numerous playoff games for CBS Radio, including 17 Super Bowls (the most of any announcer). Buck also served as a radio broadcaster for the football Cardinals in 1980 and 1981, and returned to calling Sunday NFL games for CBS television from 1982 to 1987. Late in the 1990 NFL season, Buck's onetime CBS broadcasting partner, Pat Summerall, was hospitalized with a bleeding ulcer after vomiting on a plane during a flight after a game, and was out for a considerable amount of time. While Verne Lundquist replaced Summerall on games with lead analyst John Madden, Buck (who was at the time the network's lead Major League Baseball announcer) filled in for Lundquist, teaming with Dan Fouts to call two games (both of which coincidentally featured the Cardinals, who had moved from St. Louis to Arizona by that time). While much better known for his baseball and football commentary, Jack Buck was also the original voice of the St. Louis Blues of the National Hockey League. 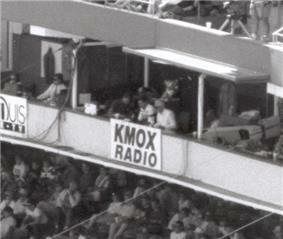 Buck was paired with Jay Randolph and Gus Kyle on Blues broadcasts and covered the 1968 Stanley Cup Final for KMOX radio. He was succeeded after one season by broadcaster Dan Kelly. Buck also broadcast for the St. Louis Hawks and Rochester Royals of the National Basketball Association, and called professional wrestling, boxing, and bowling at various times in his career. 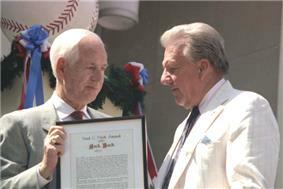 Jack Buck (left) with Ralph Kiner at the 1987 Hall of Fame induction ceremony. He is most famous for his coast-to-coast radio call of Kirk Gibson's game-winning home run in the bottom of the 9th inning of game 1 of the 1988 World Series and his disbelief at Gibson knocking it out while hobbled by injuries to his right hamstring and left knee. His call of the play is so famous that it's sometimes played over the television footage of the play. The television call was handled by long-time Dodgers announcer Vin Scully on NBC. Buck wasn't intended to be the main play-by-play announcer for CBS baseball telecasts when the network acquired the sport from NBC and ABC. Originally assigned to the network's #2 crew (and therefore, work with Jim Kaat), he was promoted at practically the last minute after Brent Musburger was fired on April Fools Day of 1990. After two years of calling baseball telecasts (including the Saturday afternoon Game of the Week, All-Star Game, National League Championship Series, and World Series), Buck was dismissed by CBS. The official reasoning behind Buck's ouster was that he simply had poor chemistry with lead analyst Tim McCarver. Buck was soon replaced by Boston Red Sox announcer Sean McDonough. Buck later noted that "CBS never got that baseball play-by-play draws word-pictures. All they knew was that football stars analysts. So they said, 'Let McCarver run the show ... In television, all they want you to do is shut up. I'm not very good at shutting up." Buck was criticized by some for his alleged habit of predicting plays on air. Buck made controversial statements about singer Bobby Vinton prior to Game 4 of the 1990 National League Championship Series. After Vinton muffed the lyrics of "The Star-Spangled Banner" in his home town of Pittsburgh, Buck lightly referenced Vinton's Polish heritage. Buck soon got death threats from Pittsburgh Pirate fans, who even went as far as leaving a footprint on Buck's hotel pillow. The next day, CBS Sports executive producer Ted Shaker spotted Buck in the hotel lobby and told Buck that he was in trouble. The final baseball play that Jack Buck narrated for CBS television was Gene Larkin's game winning bloop single in Game 7 of the 1991 World Series. In all, Buck called 11 World Series, 18 Super Bowls, and four Major League Baseball All-Star Games. Over the course of the 1990s, Buck decided to reduce his schedule to calling only Cardinals home games (or 81 games a year unless there was a "special occurrence"). Health concerns obviously could have played a factor in this, as Buck suffered from such ailments as On a road trip to Wrigley Field on June 6, 2001, Buck sang the seventh-inning stretch tune, "Take Me Out to the Ballgame" substituting "the Cardinals" for the "Cubs/home team" portion of the song. In 1998, the Cardinals dedicated a bust of Buck that showed him smiling with a hand cupping his left ear. In 1999, he lent his name to a restaurant venture called J. Buck's, with the restaurant's name being shared with son Joe and daughter Julie. 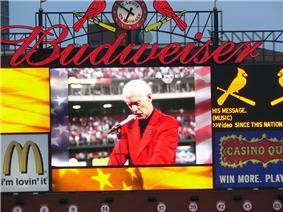 One of Jack Buck's final public appearances was on September 17, 2001 at Busch Memorial Stadium in St. Louis. It was the first night that Major League Baseball resumed after the terrorist attacks of September 11. Although looking rather frail (Buck at the time was sick with lung cancer) and struggling to maintain his composure (Buck was obviously showing the signs of Parkinson's disease as well), Buck stirred emotions by reading a patriotic-themed poem during the pregame ceremonies. He concluded by silencing critics who thought baseball had come back too soon: "I don't know about you, but as for me, the question has already been answered: Should we be here? Yes!" Video Replay on the scoreboard at Busch Stadium shown on the 5th anniversary of the 9/11 attacks of Buck reading his For America poem at Busch Memorial Stadium before the first Cardinals game after the 9/11 attacks. Buck wrote a poem named For America that he read at the first Cardinals game after the 9/11 attacks to describe his opinion and the general opinion, regarding defeating terrorism, of Americans after September 11. Jack Buck died on June 18, 2002 in St. Louis's Barnes-Jewish Hospital from a combination of illnesses. He had stayed in the hospital for all but the first two days of January 2002. He was in the hospital to undergo treatment for lung cancer, Parkinson's disease, and to correct an intestinal blockage. His death shook the St. Louis community: within two hours of his death, fans were leaving flowers at the base of his bust outside Busch Stadium even though it was the middle of the night. The flags at St. Louis City Hall and the St. Louis County Government Center were lowered to half-staff, the local television news anchors all wore black suits for the next several days, and a public visitation was held in the stadium before the next baseball game after his death, with free admission to the game for all the mourners who filed past his coffin. Buck was interred at Jefferson Barracks National Cemetery in south St. Louis County. His spot on the KMOX Cardinals broadcasts was subsequently filled by former Colorado Rockies announcer Wayne Hagin. Hagin, now with the New York Mets, moved over to television, and his spot was filled by one of Buck's protégés, former Chicago White Sox announcer John Rooney. Buck's youngest son, Joe, read the eulogy at his father's church funeral. Jack Buck had eight children in all; five daughters and three sons. Joe Buck is currently the lead play-by-play announcer for both Major League Baseball and the NFL on the Fox network. Joe Buck has also done occasional local telecasts for the Cardinals as well as commercials for a local automobile dealership. Jack and Joe Buck are also the only father and son to call play-by-play of Super Bowl telecasts. During postseason telecasts, Joe has often paid homage to his father by signing off with "We'll see you tomorrow night!" When the Cardinals won the 2006 World Series, Joe quoted his father again saying, "For the first time since 1982, St. Louis has a World Series winner! ", referencing Jack's line when the Cards won in 1982, "And that's a winner! That's a winner! A World Series winner for the Cardinals!". During the 2011 Series, Joe punctuated David Freese's 11th inning walk-off homer for the Cardinals in Game 6 with "We will see you...tomorrow night! ", near similar to the 1991 Puckett home run description, a call he said he did to celebrate Jack, but would never repeat again in the same situation. However, when the Cardinals won Game 7, he did not quote his father. Buck received the Ford C. Frick Award for broadcasting from the National Baseball Hall of Fame in 1987, and the Pete Rozelle Radio-Television Award from the Pro Football Hall of Fame in 1996. The Missouri Sports Hall of Fame inducted Buck twice, as a media personality (1980) and Missouri sports legend (2000). The National Sportscasters and Sportswriters Association named Buck as Missouri Sportscaster of the Year 22 times, and inducted him into its Hall of Fame in 1990. Buck was also inducted into the American Sportscasters Association Hall of Fame in 1990, the Missouri Athletic Club Hall of Fame in 1993, the National Radio Hall of Fame in 1995, and the NAB Broadcasting Hall of Fame in 2005. The American Sportscasters Association ranked Buck 11th in its listing of the Top 50 Sportscasters of All Time in 2009. Buck is honored with a star on the St. Louis Walk of Fame, and a bronze statue of him was erected at the entrance to Busch Memorial Stadium in 1998 (and moved to a new location outside the current Busch Stadium in 2007). A section of I-64/US-40 in St. Louis is named the Jack Buck Memorial Highway in his honor. A new bridge being constructed spanning the Mississippi River between St. Louis and East St. Louis will be named in his honor. In January, 2014, the Cardinals announced Buck among 22 former players and personnel to be inducted into the St. Louis Cardinals Hall of Fame Museum for the inaugural class of 2014. The Jack Buck Award, presented by the Missouri Athletic Club "in recognition of the enthusiastic and dedicated support of sports in St. Louis", is named in his honor. Third and goal, quarterback sneak, touchdown, Green Bay! —Calling the Green Bay Packers' final touchdown in the 1967 NFL Championship Game (aka the "Ice Bowl"). He takes off his cap. He mops his brow. He looks in and gets the sign. He starts the windup. Here's the pitch and it's ... A STRIKE CALLED! A NO-HITTER FOR GIBSON! Simmons roars to the mound, embraces Gibson who is engulfed by his teammates as the Cardinals win the game, 11–0! —Calling the final out of Bob Gibson's 1971 no-hitter. Gibson struck out Willie Stargell to secure the only no-hitter of his legendary career. Brock takes the lead, Ruthven checks him. He is ... GOING! The pitch is a strike, the throw ... he is there! HE DID IT! 105 for Lou Brock! —Calling Lou Brock's single season record-breaking 105th stolen base of the 1974 season. He's going! The pitch is high, the throw is ... safe! He stole it! The throw got by the shortstop and Brock has done it! They would've thrown him out, but the shortstop couldn't handle the bad throw and this is it, folks. Brock has now stolen 893! —Calling Lou Brock's career record breaking 893rd stolen base in 1977. Breaking ball, hit off the pitcher, TO THE THIRD BASEMAN!!! No play! Base hit! Three thousand for Lou Brock! —Calling Brock's 3,000th career hit in 1979. Montana lines up at the five. And on third-down-and-three he rolls right, looking to throw ... looking to throw...and he throws into the end zone, touchdown! Touchdown! Touchdown, San Francisco, by Dwight Clark! —Calling "The Catch" in the 1981 NFC Championship Game. Sutter from the belt, to the plate...a swing and a miss! And that's a winner! That's a winner! A World Series winner for the Cardinals! —Calling the last out of the 1982 World Series. Bruce Sutter struck out Gorman Thomas. Smith corks one into right, down the line! It may go!! ... Go crazy, folks! Go crazy! It's a home run, and the Cardinals have won the game, by the score of 3 to 2, on a home run by the Wizard! Go crazy! The Dodger right-hander is set and here's his pitch to Jack Clark. Swing and a long one into left field! Adios, goodbye, and maybe that's a winner! A three-run homer by Clark and the Cardinals lead by the score of 7 to 5 and they may go to the World Series on THAT one, folks! —Calling Jack Clark's 9th inning three-run home run off Niedenfuer in Game 6 of the 1985 National League Championship Series to give the Cardinals the lead and the National League Pennant. Orta, leading off, swings and hits it to the right side, and the pitcher has to cover he is ... SAFE! SAFE! SAFE! And we'll have an argument! Sparky, I think he was out! —Calling Don Denkinger's blown call in Game 6 of the 1985 World Series that ignited a Royals game-winning rally. Here's the pitch to Mookie Wilson. Winning run at second. Ground ball to first, it is a run...an error! An error by Buckner! The winning run scores! The Mets win it 6 to 5 with three in the 10th! The ball went right through the legs of Buckner and the Mets with 2 men out and nobody on have scored three times to bring about a seventh game, which will be played here tomorrow night. Folks, it was unbelievable. An error, right through the legs of Buckner. There were 2 on, nobody out, a single by Carter, a single by Mitchell, a single by Ray Knight, a wild pitch, an error by Buckner. 3 in the 9th for the Mets. They've won the game 6-5 and we shall play here ... tomorrow night! Well, open up the history book, folks, we've got an entry for you. —Calling the final moments of Game 6 of the 1986 World Series. Off the stretch, Orosco, here's the pitch...swing and a long one into left field! Way back in the corner...GRAND SLAMMMMMAAHHH! A grand slam home run by Herr! And that's a winner! Twelve to eight! —Calling Tom Herr's game-winning grand slam home run on Seat Cushion Night against the New York Mets in April 1987. Here's the pitch...Swing and a fly ball, you want another winner here? Coleman going to it ... YOU GOT IT! That's a winner! 6–0 Cardinals! —Calling the final out of the 1987 National League Championship Series as the Cardinals advanced to the 1987 World Series. Gibson ... swings and a fly ball to deep right field. This is gonna be a home run! UNBELIEVABLE! A home run for Gibson! And the Dodgers have won the game, five to four; I don't believe what I just saw! I don't BELIEVE what I just saw! —Calling an injured Kirk Gibson's walk-off home run in Game 1 of the 1988 World Series off of Dennis Eckersley. Montana is back to throw. He looks and throws, end zone ... TOUCHDOWN! Touchdown ... to John Taylor with 34 seconds left! A 10 yard touchdown pass to John Taylor, and the 49ers lead by three, and the extra point will put the nail in the Cincinnati coffin. There's the snap; there's the kick. It is up; it is...NO GOOD! Norwood missed! Four seconds left. The Giants have won Super Bowl XXV by the score of 20–19. Into deep left center ... for Mitchell ... and we'll see you ... tomorrow night! —Calling Kirby Puckett's walk-off home run in Game 6 of the 1991 World Series. The Twins are gonna win the World Series! The Twins have won it! It's a base hit! It's a 1–0, ten inning victory! —Calling Gene Larkin's game-winning hit in Game 7 of the 1991 World Series. McGwire ... SWING ... looky there! LOOKY THERE!!!! Looky there! McGwire's number sixty-one!!! McGwire's flight 61 headed for Planet Maris! History! Bedlam! What a moment! Pardon me while I stand up and applaud! —Calling Mark McGwire's single season record-tying 61st home run in 1998. ^ "LISTEN: Jack Buck Introduces First "At Your Service" Program On KMOX". CBS St. Louis. June 13, 2012. ^ Thomas, Robert McG., Jr (March 27, 1989). "Sports World Specials; The Ring of Truth". The New York Times. ^ Buck never could come to terms with emphasis on analysts in televised sports. He always believed that a good play-by-play broadcast is what the people wanted. ^ Buck took a lot of criticism from national audiences, as well. Numerous critics pointed out his tendency of predicting plays on the air. This sometimes led to him making the wrong call, and confusing the listeners. ^ "J. Buck's opens downtown St. Louis restaurant". St. Louis Business Journal. June 19, 2007. Retrieved 2013-01-06. ^ Caesar, Dan (28 October 2011). "Joe Buck honors father in Series call". ^ "Cardinals win 2011 World Series". MLB.com. Major League Baseball. October 28, 2011. Retrieved October 29, 2011. ^ Cardinals Press Release (January 18, 2014). "Cardinals establish Hall of Fame & detail induction process". www.stlouis.cardinals. Garner, Joe (2000). And The Fans Roared. Naperville: Sourcebooks. Richard Sandomir of the New York Times writes about Michael J. Fox remembering the late Jack Buck as he taped a public service announcement with Joe Buck and Tim McCarver for Parkinson's Disease.